Before sending push notification messages or emails you need to add credentials to the deltaDNA platform in order for deltaDNA to make requests to the Apple & Google notification sending APIs and 3rd party email providers like SendGrid on your behalf. Upload the SSL certificate and Private key for you Push Notification provisioning profile and enter the password. Please see the SDK integration documentation and the Apple and Google developer documentation for further information on setting up the required certificates and keys. 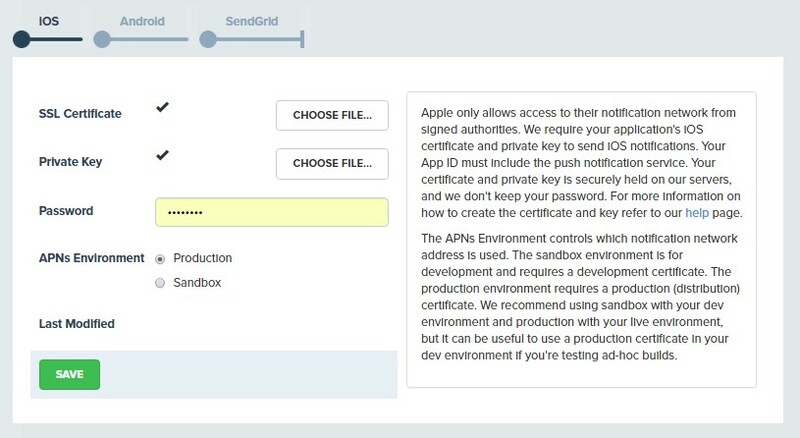 Enter the username and password used to access your SendGrid email account and provide an email address that you would like to appear as the From Email address in your emails. You can also provide a more friendly name using the From Name field. See the SendGrid Account Settings page for more information on Configuring your SendGrid account. SendGrid email will not deliver or report correctly unless you do this!